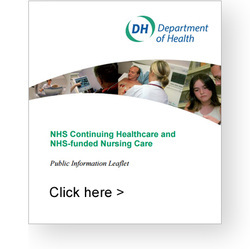 In getting this far with reading about NHS Continuing Healthcare you will have gathered that the application process is subjective, complicated and sometimes frustrating. As someone who has worked in this field for over 15 years I am able to offer a range of services designed to suit your individual requirements as you progress through the different layers of administration. I can guide and support you through the whole process, starting with the application of the Checklist which will help you understand the strength of your case, or review a Decision Support Tool (DST) and other relevant information to help you with your application for CHC funding for the first time, or through the Appeals process at both local level and NHS England if that becomes necessary. If you are managing the administrative process yourself with local Clinical Commissioning Group (CCG) I am on hand to offer support, advice and assistance as you need it. To reflect the varying and sometimes complex nature of the CHC process my fees are proportionate and based on a sliding scale to reflect the degree of involvement you wish me to have in you or your relative's case and that which would best suit your individual needs and requirements. Full details of fees and my terms of business are available on request. If your application is successful and the CCG agrees to fund you or your relative’s package of care at home or residential care placement, your health needs will be reviewed at regular intervals. This process differs from the initial application in that you do not need to satisfy the criteria of the Checklist before graduating to the full assessment. When carrying out the review the multi-disciplinary team (MDT) will work together as they did before to complete a new health needs assessment. Once the review is complete the MDT will put forward their Decision Support Tool recommendation to the CCG for their final decision. I am able to support you when the time comes to review you or your relative's health needs, ensuring that you are equipped with all of the information you need to make certain that the Decision Support Tool properly represents you or your relative's needs. Should the CCG conclude that you or your relative are no longer eligible for funding and you are unhappy with their decision I can also support you through the Appeal process at local level and with NHS England. The path to NHS Continuing Healthcare eligibility can be lengthy, time consuming and often stressful. It is therefore crucial that you understand the strengths and weaknesses of your individual case. You can be assured that at all times I will advise you honestly on the strength of your case, and the likelihood of success should you go ahead with your application to the CCG. If you think that you might be eligible for NHS Continuing Healthcare and would like to discuss your circumstances with me, or any other questions you might have about the information you have read here, please feel free to contact me or phone me on 01207 583788 without any obligation. I look forward to hearing from you.
" Kate Hurley has helped our family over the last two years, with two assessments and subsequent reviews. Kate knew exactly how to interpret the DoH's eligibility criteria and her medical training was clear as she carefully assimilated our personal knowledge and experiences with the medical evidence available. Kate spoke the same language as the professionals and also identified the necessary detail which gave us the confidence to successfully challenge one assessment for eligibility. Kate also helped with two retrospective funding claims. As relatives dealing with various multi-disciplinary teams, mental health problems, nursing needs and very challenging behaviour we relied heavily on Kate, she was always available to answer our questions, identify areas of need and offer her invaluable experience in this specialist area. I wouldn't hesitate to recommend Kate's services and I can't praise her highly enough." Kate Hurley RN, DN Dip, PG Dip (Health Studies & Management), PG Cert.